As the United States prepares for Hurricane Florence, an even bigger ocean storm, Super Typhoon Mangkhut, is set to hit Southeast Asia. The storm also threatens the Philippines and Hong Kong. The super typhoon, known as Ompong in the Philippines, has winds of up to 250 kilometers per hour. That is considered a category 5 hurricane in North America, the most severe level. More than 4 million Filipinos live in areas the storm could affect. Emergency officials say nearly 48,000 houses in high-risk areas are made of light materials and could be damaged by the powerful winds. Experts say Super Typhoon Mangkhut could cause landslides and flooding across the northern Philippine island of Luzon. The super typhoon is expected to reach the Philippines Saturday at the start of the harvest season in Luzon. The island is a major agricultural producer and farmers are trying to save what they can of their crops. 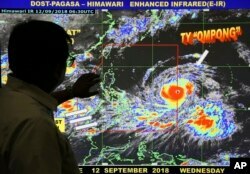 Forecaster Meno Mendoza shows the path of Super Typhoon Mangkhut, locally named "Typhoon Ompong," as it approaches the Philippines at the Philippine Atmospheric, Geophysical and Astronomical Services Administration in Manila, Sept. 12, 2018. Mangkhut already has hit the U.S.-island territory of Guam. The Pacific Daily News reported the storm flooded streets, brought down trees and cut electrical service. About 80 percent of the island was without power but service restarted by Thursday morning. Mangkhut is the 15th storm to hit the Philippines and the most powerful to hit Asia this year. Last week, Typhoon Jebi struck Japan killing more than 10 people. Hai Do adapted this story for Learning English based on AP and other reports. Mario Ritter was the editor.